BRISTOL - Jake Mather had been producing all tournament for Rhode Island but he was still looking for his first home run. In the Little League New England Regional championship game against Massachusetts, Mather delivered that allusive hit, a game-deciding solo homer to left field in the top of the fifth inning off Massachusetts starting pitcher Evan Blake. It led Rhode Island past Massachusetts 3-2 Sunday at Breen Field and punched Rhode Island’s ticket to Williamsport, Pa. for the Little League World Series. Mather finished the game 3-for-3 with the home run and a pair of runs scored. In the tournament Mather hit .668 in 16 at-bats. 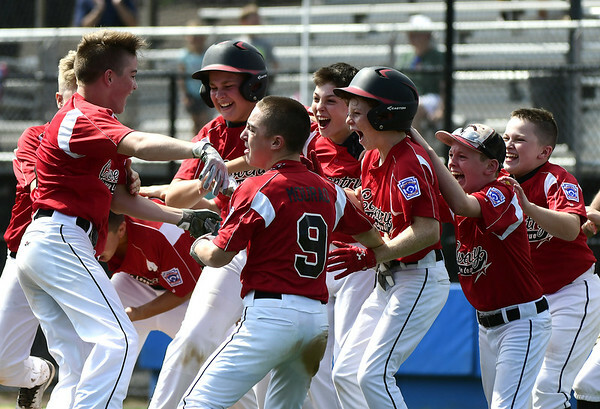 It’s the fourth time in the past five years that a Rhode Island team has won the New England Regional and advanced to the Little League World Series. Logan Lama delivered a big time pitching performance for Rhode Island in his first start of the tournament. He pitched 4 2/3 innings, allowing two earned runs, three hits, walked five and struck out five. Massachusetts had two chances in the bottom of the sixth inning to strike but both were done in by aggressive base running. Cam Sime and Owen Salvatore were both thrown out trying to advance to second base. Sime fell rounding first base and Salvatore was thrown out trying to advance on a ball that got past Rhode Island first baseman Kody Fretts. Sime also had a bad hop at shortstop, which led to Rhode Island scoring the first two runs of the game in the top of the third inning. Massachusetts scored its two runs off walks from Lama, who lost his control in the third inning with four walks. Ben Jacob and Evan Blake scored the two runs for Massachusetts. Blake, Massachusetts most dangerous hitter in the tournament, finished 1-for-1 with a single and two walks. He was intentionally walked in the bottom of the third inning. Fretts, Tommy Turner and Will Owens had the other hits for Rhode Island. Jake Duquette, Sime and Roshan Warriar had the rest of the hits for Massachusetts. Anthony Colucci came in to close the game for Rhode Island with a steady 1 1/3 innings, allowing just one hit. Blake pitched five innings for Massachusetts, allowing three earned runs and striking out eight. Sime pitched a scoreless eighth inning in relief of Blake. Rhode Island will look to replicate its success at the Little League World Series and the group believes it is just getting started. Posted in New Britain Herald, General Sports on Sunday, 12 August 2018 16:14. Updated: Sunday, 12 August 2018 16:16.